This Hawai’i Island helicopter flight celebrates the smouldering giants in a really unique way. When you think Hawaii, you think blue skies, colorful beaches, thick rainforests and of course, perhaps the most powerful image of them all, fiery volcanoes! This Hawai’i Island helicopter flight celebrates the smoldering giants in a really unique way. You’ll depart from Kona Airport in a Bell 407 helicopter with two-way pilot communication. Head over the Kona coffee district, situated by Hualalai and Mauna Loa. 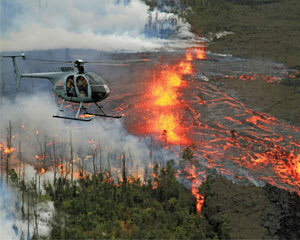 Make your way to the Kilauea crater. On some days you may even see the red hot lava seethe from within! From here, you’ll also get wild views of Hilo and the East Hawai’i rainforests. Now’s the part of the trip where you touch down in Kohala! Relax and take in the otherworldly views or go exploring on your own for a full hour. The way back offers even more exceptional photo opportunities including Waikoloa and its white, sandy beaches! This is the only Hawai’i helicopter tour that actually let’s you touch down and trek Kohala! Pair that unique experience with two hours of flight time and you’re looking at one of the Big Island’s biggest adventures!